About a year ago I decided I wanted to stop using white sugar in my baking. It's true that my family would probably be better off with no sugar, but that's not really what I was going for. Specifically, I wanted my sugar to be less refined and, in particular, not bleached. So I began doing some research on the different types of unrefined cane sugars out there (raw sugar, evaporated cane juice, turbinado, demera, rapadura, muscavado, panela, sucanat, etc.). In trying to figure out what exactly was the difference between all these unrefined brown sugars, I ended up also learning about the many liquid sweeteners now available that are not derived from cane sugar. There are many names for unrefined brown sugar, or sugar with some molasses left in it, and, as far as I can tell, sucanat is one of the least refined of the granular cane sugars. It tastes like brown sugar, but not as sweet. I have used it instead of brown sugar (for example, in cookies), and instead of white sugar in recipes where the molasses flavor would not be a problem (for example, pancakes). You can substitute one cup for one cup, but I have found it to be a bit less sweet than white sugar. If sucanat won't work as a substitute for white sugar in a recipe, then I use organic cane sugar, which is unbleached, consists of larger crystals than white sugar, and looks just like "raw sugar" or turbinado sugar (both more expensive) to me. Honestly, I'm not sure what the exact differences are between the numerous types of brown sugar, or if the names are used consistently. Organic cane sugar substitutes one-for-one with white sugar and is just as sweet. Organic cane sugar is the cheapest of the sweeteners I use (about $1/lb.). Raw honey is my sweetener of choice. I can purchase it locally from the producer. It is unrefined and unprocessed. It is more sweet cup-for-cup than white sugar and can often be substituted for white sugar. 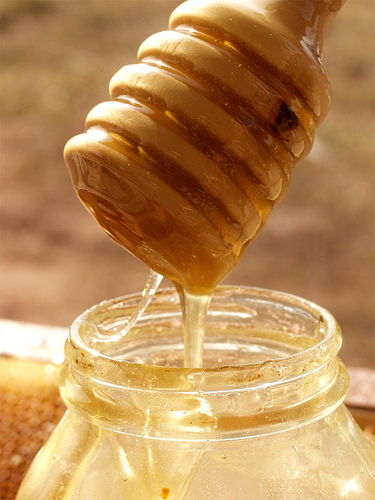 I have always used honey in whole wheat bread, white bread, granola, granola bars, and to top plain yogurt. I have also found that I can use honey instead of sugar in pancakes and many cookies. After reading about "honey laundering," I only purchase local honey from trusted producers. When substituting honey for white sugar, use 1/2 to 3/4 cup honey per cup sugar and reduce the amount of liquid by about 1/4 cup for every cup of sugar substituted. Maple syrup is also straight from nature, but it is quite expensive as sweeteners go (I can buy raw honey for a lot less than I can buy conventional maple syrup). Maple syrup also has a distinctive flavor that might not work in many recipes. I love maple syrup as a topping for pancakes or yogurt. I use it as a sweetener in pancakes, whole wheat bread, granola, and granola bars. In fact, when my baby is under one and not supposed to be eating raw honey, I regularly use maple syrup in most recipes in which I'd normally use raw honey. Like honey, maple syrup is sweeter than white sugar and should be substituted about 3/4 cup per one cup sugar (reduce liquid by 1/4 cup). Molasses comes from sugar cane and is a by-product of creating granular white sugar. Molasses, particularly blackstrap molasses, has some nutrients in it, but I wouldn't try to convince yourself that it is good for you. Nonetheless, you can't make ginger snaps without it. I use molasses occasionally in whole wheat bread, pancakes, or cookies. It is less sweet than sugar, so use 1 1/4 cups for each cup of white sugar if you are trying to achieve the same sweetness (reduce liquid by 1/4 cup or more). There are numerous other liquid sweeteners out there now (sorghum, agave syrup, barley malt or rice syrup, and brown rice syrup). I favor honey, maple syrup and molasses because I know what they taste like and know how to use them. All of the sweeteners I use now are more expensive than white sugar, which in my opinion is not entirely a bad thing. It helps remind me to use sweeteners sparingly in my cooking and baking. Here are some tips for reducing your consumption of sugar and other sweeteners in the foods you buy and in the foods you make. Drink water. If you skip the soda and other beverages, you save yourself oodles of money, calories, and massively reduce your consumption of sweeteners whether high fructose corn syrup, artificial sweeteners, or cane sugar. Use sugary foods as special desserts instead of snacks throughout the day. Try using less refined sweeteners in place of conventional white sugar. You may have heard that a calorie is a calorie, but your body processes different calories differently. Thanks for the lovely blog and comments on sweeteners, lovely and educating! Thank you for sharing this. I will probably use it for a reference when baking and substituting from now on. I like your tip to drink water. I got a free bottle of organic agave syrup that I've been using in my husband's tea, but he told me last time that I made it too sweet. I just made more today, so hopefully I did better this time. I have been struggling with this too. Thank you for this break down. I'm pinning it now! I have discovered that dates are a great way to add sweetness to certain things. I make "fudge bars" using dates, walnuts or almonds, cooked quinoa, cocoa powder and a small amount of chocolate chips. They are delicious! And have you ever tried a fresh date! Like eating candy! At least for me. My kids still don't like them, but I'll keep trying. Well, I too consider this points before purchasing any type of sweetener. I had recently purchased a stevia sweetener which contains all this aspects in it.